Many people have difficulty in drawing objects in perspective. Most of the time it helps if you have that particular object in front of you, but we still need our imagination.The most important aspects of perspective are size and distance. If you increase the distance between you and the object you are observing, you need to decrease the size of that object. That way you can achieve a nice depth effect in your illustrations. 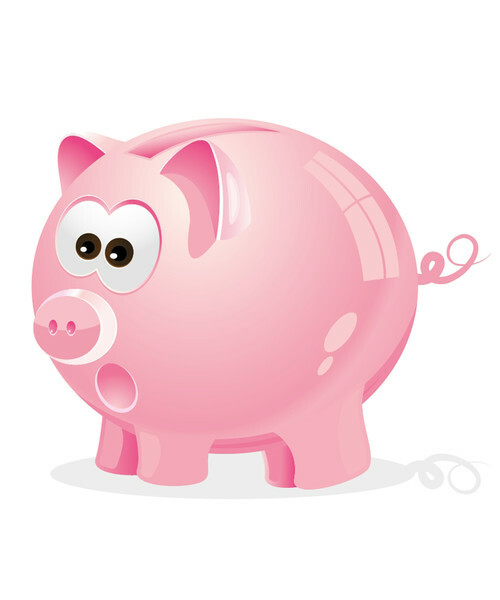 In this post we’ll be learning how to create a cute pink piggy bank in perspective with the help of Adobe Illustrator CS4. Enjoy! Rotate the eyes a bit and place them on the Piggy Bank. You can see how the smaller eye makes the impression of the perspective. We will have to do that with other parts of the Piggy Bank as well. Let’s continue with the eyes. Since our imaginary source of the light is above the Piggy Bank we need to make a highlight on the eyes. Let’s copy-and-paste in front of the eyes. You can do that by selecting the eyes and then hitting Ctrl+C for copy and Ctrl+F for paste-in-front on your keyboard. That way, you’ve made a copy of the eyes. I think we are on the right track to make a very cute Piggy Bank! Now let us create its ears with some shadows and reflections. Don’t forget, the Piggy Bank is usually made of plastic or clay, which means that we have to try to simulate that look. We can also make a reflection of the window on the Piggy Bank. Select the body of the Piggy Bank. Make a copy of it (Ctrl+C, Ctrl+F) and scale it down a little bit. Now we need to add some anchor points and to delete others in order to get the path which we’ll be using to draw the rest of the window reflection. Using the Pen Tool (P) we can add anchors and with the Direct Selection Tool (A) we can select the anchor points we need to remove and hit the Delete key on the keyboard. Use your imagination and make different faces for the Piggy Bank. It can be fun. Here are some of my results! I really hope you enjoyed this tutorial. Using all these techniques we’ve used here, you can create pretty much anything. Just don’t be afraid to experiment with colors, gradients and shadows. Use them wisely and you’ll be able to achieve great realistic looks for your illustrations. Keep in mind to follow all the rules for perspective drawing. If you happen to have any questions feel free to post it in the comment section below. Thank you for reading! Kewl! Love this very much!! Thanks for the tutorial, it was fun and helpful. I had just a little problem with using pathfinder and groups at the same time. when you are using a Pathfinder Panel just make sure to ungroup the shapes you are using. Those shapes should be in the same Layer. Is very hard to work in illustrator.. but i want learn. Illustrator is a specific software, and it has it own “rules” for creating illustrations. Once you get to know all the Illustrator features you will love everything about it. Some tips are very difficult, but I’m trying again and again. I hope, I can do this. Thanks for your tutorial. Thank you for the comment. If there is something I could explain better just let me know. hey i did that pig and i understood all the steps,i never used the illustrator so much but with this tutorial i enjoy it a lot… i hope you can post more.. congrats..:D! amazing ! very very helpful for me thanks you. I hate to complain, but it’s so typical that you just put in a direction without explanation and the whole thing is set back. I can’t make the gradient look the way you made it look and I’m fed up trying. Why it has to be different than Photoshop, I don’t know. what an adorable piggypoopoo! I’m a raster digital artist learning vector, and this will really help. and I love pigs! Perspective with Adobe Illuystrator – noupe <Loved it!